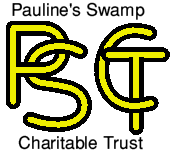 The Swamp (now officially called Pauline's Swamp) was given to the parish of Burwell by Paul Hawes in 2008. Click on the map to see its location in OpenStreetmap. The arrow points to the footpath from Burwell Castle to Reach Road. Cross Reach Road and you will benter Love Lane which leads to Pauline's Swamp. It consists of a field and a wooded area centred at at map reference TL 585 657, outlined in red on the map. The two halves of the field are separated by a small seasonal stream. To the east the field is mainly wooded - an Aspen grove, old coppiced hazels and a blackthorn thicket. Total area is about 4.4 acres. The seasonal stream flows from a spring-fed pond in the adjacent property. From here it flows beneath the old, disused Cambridge to Fordham railway line (which was closed to passengers in 1962 and completely closed in 1965). Adjacent to the spring is a pond which is clearly artificial as it is nearly square. The pond had no direct connection to the stream being fed only by ground water and rain, but in 2017 channels were dug so the stream can feed the pond directly. 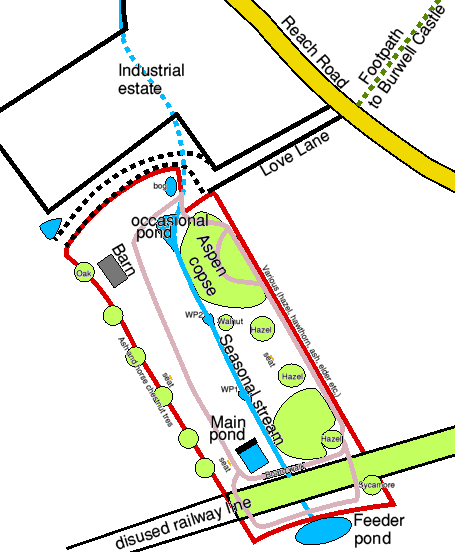 Access to the swamp is via Love Lane in the top right of the map. This once continued around the north of Pauline's Swamp (you can see the dotted lines) as access to the fields. However this section now is heavily overgrown by brambles. Gallery of Photographs of the Swamp. List of Plants found in the swamp. This list is also available as a text file. A chart showing flowering season of some of the plants in the swamp. Trees of Pauline's Swamp Some of the trees in the Swamp have labels with QR codes which direct to these pages. 2018 Diary of Pauline's Swamp where I record plants in flower, maintenance, changes and other events. 2019 Diary. I am not keeping up a diary because of complete lack of interest (amounting to actual antagonism) from the trustees. In fact, one of the Trustees (Gus Jones who is also a parish councilor) said in a general email "Would it be an idea to ignore messages from Richard Torrens.?" Kingfisher's Briidge Nature Reserve help to manage Pauline's Swamp.